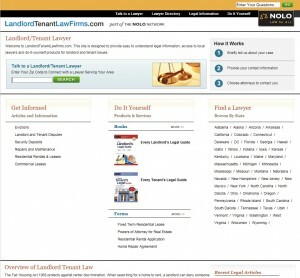 Today, we unveiled our first Nolo Network website: www.landlordtenantlawfirms.com. Just like one of our first books, California Tenants’ Rights, now in its 18th edition…we started with landlord-tenant law. Designed to provide consumers with everything from high-quality information to getting a lawyer, www.landlordtenantlawfirms.com is the first of many Nolo Network sites to come!